The Safe Routes to School (SRTS) program helps community leaders, schools and parents improve safety and encourage more children to safely walk and bicycle to school. The program works toward reducing traffic congestion and improving health and the environment, making communities more livable for everyone. Shasta County Health and Human Services Agency received a 3-year grant from the Active Transportation Program (Caltrans) to coordinate education and encouragement activities for children to walk or bike to school. The program serves Redding School District and the Cascade Union Elementary School District in Anderson. The program also offers assistance to all schools in Shasta County. For more information, contact Sara Sundquist or Nicole Eller at 245-6457 or srts@healthyshasta.org. National Bike to School Day is in May! Walk to School Day is each October. 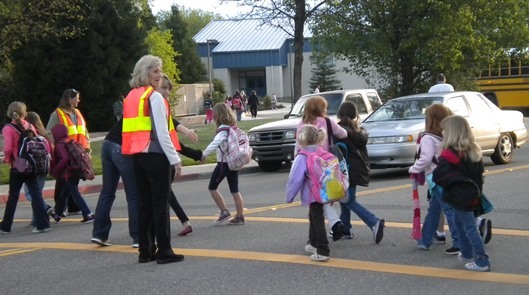 Shasta Safe Routes to School offers support to schools on pedestrian safety and school events. Contact us to get your school involved. W2S full-page flyer (pdf)- Use this one to post information around campus. W2S half-page flyer (pdf)- Send this one home with the students! We’ll provide the copies you need. Just fill in the blanks on the flyer and then email the file to srts@healthyshasta.org. Be sure to let us know how many students will need flyers. Education – teaching pedestrian, bicyclist and traffic safety and creating awareness of the benefits of walking/biking to school. Encouragement – building interest and enthusiasm by offering incentives to increase the number of students walking/biking to school. Enforcement – enforcing rules for safe walking, bicycling and driving, along with neighborhood watch programs. Engineering – slowing down traffic and installing paths, sidewalks, and safer crossings. Evaluation – assessing the number of children walking/biking to school and finding out why they do it to determine program goals and objectives. Any Shasta County Schools can request assistance and resources – we now serve high schools! Has your child ever asked if he/she can walk/bike to school? Kids think its fun to walk and bike! Support their desire to walk/bike by walking/biking with them to school. Live too far away to walk? Park a short distance from school and walk from there. If your child takes the bus, walk him/her to the bus stop. Walking to school is a great way for kids to get exercise before starting their school day and relieve congestion in front of the school, making it safer and easier for more children to walk/bike. Why is Walking to School Important? Thirty-three percent of children are overweight. Children need at least 60 minutes of physical activity a day for their health. Studies show when children are physically active before school, they are more prepared to learn and can concentrate better in class. Up to 25% of morning commute traffic is school related. Air quality is noticeably better at schools where many children arrive by bike/on foot. Get Involved with Safe Routes to School at Your Child’s School! The McConnell Foundation has added trails and made some trails OK for bikes so that children at both Mountain View Middle School and Redding School of the Arts now have more bike and walk friendly options for commuting to school. Select Lema Ranch trails are now open to bicycles during school commute hours. See map below.